We were honored to have New York City Mayor Michael Bloomberg in attendance at one of our Helmets for Kids donations this March, sponsored by the World Health Organization. Along with Mayor Bloomberg, members of the Vietnamese and the United States governments assisted in the helmet handover. We hope that this will inspire other philanthropists to do their share in making our roads safer. Six radio spots remind Ugandans, "Your life is your wealth"
Putting the brakes on road injuries is one of development's greatest tests - With traffic injuries on an upward curve globally, Rio+20 must make safety the centerpiece of a sustainable transport policy. Da Nang raises traffic cops' salary in anti-graft move - Traffic police officers and inspectors in the central city of Da Nang will receive increased compensation as authorities strive to tackle bribery and other forms of corruption. 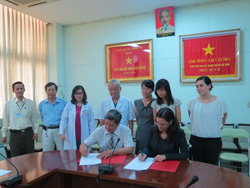 On March 14th, a Memorandum of Understanding was signed between AIP Foundation and Cho Ray Hospital, the largest general hospital in Vietnam. Present at the signing were Dr. Nguyen Truong Son and Dr. Nguyen Van Khoi, Director and Vice Director of the hospital, as well as Dr. Duong Minh Man, head of the Brain Injury Department, Dr. Nguyen Phong, head of the Neurosurgery Department, and representatives from the Public Relations Department and Administration and Equipment Departments. This contract ensures that AIP Foundation and Cho Ray will collaborate on the child helmet public awareness campaign that will last until December 2014. Specifically, AIP Foundation will provide television screens which will be installed in the Head Injury Departments and used to air videos alerting patients and families to the dangers of the road and the importance of helmet wearing. 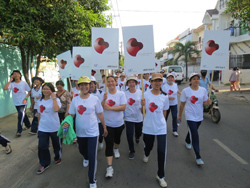 On March 10th, a parade of hundreds of people marched through Ho Chi Minh City's District 9, showing their support of the year 2012 being the national Year of Traffic Safety—and demanding safer roads for their communities. District 9's local government collaborated with AIP Foundation to organize this parade. The parade brought together People's Committee members, the Bureau of Education and Training, the women and youth associations of District 9, and hundreds of parents, teachers, and students. Banners and slogans broadcasted urgent road safety messages, accompanied by 40 motorbikes and several trucks. In support the Year of Traffic Safety in Vietnam, the Hanoi Traffic Safety Committee is collaborating with AIP Foundation to explain road safety laws and culture to Hanoians. An educational event was held at Dich Vong B Primary School in Hanoi, with 1531 students from three schools, 58 teachers, and 26 parent representatives in attendance. The event included a review of road traffic laws, and safe pedestrian behaviors were explained. 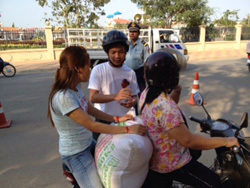 The Vietnamese traffic culture was discussed, making it clear how accidents occur and how they can be avoided. A skit put on by students made the information more relatable for young children. A photo exhibit on the theme of traffic safety provided visual cues for the attendees, and flyers summarizing key information went home to hundreds of families that evening. 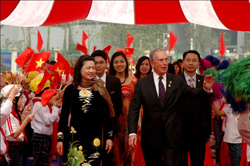 In Hanoi, New York's Mayor Bloomberg attended a Helmets for Kids ceremony at Nam Trung Yen School on March 23rd. 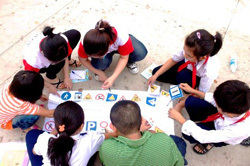 This event was run by the World Health Organization (WHO), in collaboration with Asia Injury Prevention (AIP) Foundation, Vietnam's National Traffic Safety Committee, and the Ministry of Education, Youth, and Sports. 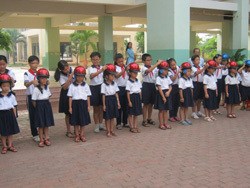 Along with Mayor Bloomberg, members of the Vietnamese and the United States governments assisted in the handover of 1,211 helmets to primary school students and teachers, which followed a training course for the school's 75 teachers on correct helmet use. While most students at Nam Trung Yen School are driven to school on their parents' motorbikes, very few wear helmets during their daily commutes. The school is located along a busy road and is next to a construction site which creates a disorganized and highly dangerous traffic environment. In addition, the students' average socioeconomic level prevents many parents from making the purchase of high quality helmets a priority. Johnson & Johnson is sponsoring AIP Foundation's largest Helmets for Kids program which will target a total of twenty schools in Ha Tinh, Quang Binh, and Dong Nai. Orientation workshops were organized in Quang Binh and Ha Tinh on March 6th and 8th to inform all of the provinces' road safety stakeholders of the project's objectives, activities, and schedule. This will, in turn, facilitate schools' participation in the development of activities to promote child helmet use. This is also a way to promote school leaders and teachers' commitment to effective implementation. 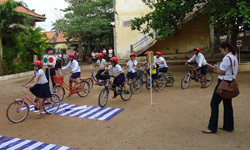 Intel Products Vietnam funded additional helmets for Nguyen Minh Quang School, after having sponsored Helmets for Kids and Safe Routes to School programs earlier this year. In an innovative and highly generous initiative, Intel provided additional funds according to the number of hours their volunteers spent educating children about road safety. The volunteers spent approximately 1,400 hours combined, fitting helmets on children, training them in correct helmet use, and facilitating the traffic safety camp. In addition, AIP Foundation and the school's principle were able to get parents to contribute 10% of the total funds. This is the first time that a program has received parental contribution, and it will hopefully lead to increased involvement from the parents' side. By insisting that their children wear the helmets they invested in, they will keep their children much safer. 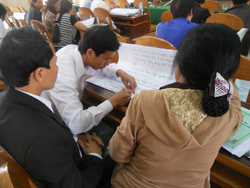 Next year, Nguyen Minh Quang School will continue to run these programs for their students. 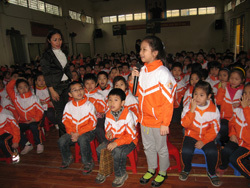 In Pham Van Chieu Primary School, ten UPS staff members joined the extracurricular activities organized as part of Helmets for Kids adopting the roles of both game judges and competitors. Traffic safety painting contests were followed by quizzes, puzzles, and a traffic safety themed fashion show. More athletic games were also run in the school yard. Of particular importance at this event was the first Traffic Safety Forum for grades 4 and 5. "Tell me and I forget. Teach me and I remember. Involve me and I learn", is a saying that reminds us that children are more likely to adopt new behaviors by being actively involved in the learning process. For this reason, presentations, role playing, and open discussion will be encouraged among older students in AIP Foundation programs. This forum, which will involve parents, teachers, and local authorities, will serve as a pilot for further implementation. Motorbike rider dies after hitting girl, 3 - A 57 year old man died after hitting a three year old girl while driving his motorbike in Kampong Chhnang. 180 helmets were donated from sponsor Diversey Hygiene to the kindergarten and first grade students at York Batr Primary School. The ceremony featured Stefan Phang from Diversey Hygiene who delivered helmet wearing instructions, conducted a magic show, and watched students perform on stage. York Batr primary school is located along the highly dangerous, traffic dense national road 1, which puts students at great risk during their daily commutes to and from school. Last July, 453 helmets were donated to the students and teachers, and this week's helmet donation by Diversey Hygiene consisted of a top-up of helmets to the newest incoming classes and to older students who had outgrown, broken, or lost theirs. In an innovative new approach, a street-based awareness project was run with the Department of Order and the Traffic Safety Police. Traffic police waited at checkpoints along National Road 2 in Kandal Province, and stopped motorcycles whose passengers were not wearing helmets. Once stopped, the riders received flyers about the importance of wearing helmets. Of central importance was the upcoming passenger helmet law which is soon to be put into place. This project will be conducted throughout April along several major roads leading from Phnom Penh to outside provinces. 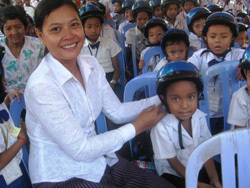 A helmet donation took place among 209 students of Hun Sen Chak Angre Primary School as part of a Helmets for Kids project which was sponsored by the Australian Embassy's Direct Aid Program. Students were asked to practice wearing their helmets correctly, riding a bicycle safety, and crossing the street properly. A drawing competition and impressive ceremony help make students excited and motivated to wear their helmets. The Australian Embassy's Direct Action Program is also supplying an additional 209 helmets to the school's kindergarteners and 1st graders. Drive to reduce Songkran carnage - The transport deputy minister, Chatchart Sittipan, said his ministry has set a target to reduce the death toll by 50% over the next eight years. On March 5th, under order of the National Road Safety Directing Center, AIP Foundation was appointed member of Sub-Committee No. 4, "Safe Behavior" for the national helmet wearing campaign's working committee. The Thailand Country Director will attend future working committee meetings in order to provide input and support to the government's nationwide helmet promotion campaign. By 2020, Thailand's goal is to achieve 100% helmet use, thereby reducing the high number of road crash fatalities and injuries. The New International School of Thailand (NIST) hosted the first Bangkok ServICE (Inspire.Connect.Empower) Conference on their campus. AIP Foundation's Thai office attended the fair, exhibiting its work and calling for increased helmet use nationwide. Around 170 international students from 11 international schools joined the event. The GRSP Asia Seminar took place on March 7th and 8th at Imperial Queen's Park Hotel. AIP Foundation attended the seminar and participated in several workshops related to road safety. These included: Road Safety Management; Program Monitoring and Evaluation; Work Related Road Safety; Improving the Star Rating of Roads and iRAP in action; Post Crash Care; Developing UN Decade Compliant Road Safety Action Plans at Country, Provice or City Level; and Effective Engineering Countermeasures and Improving Vehicle Safety. 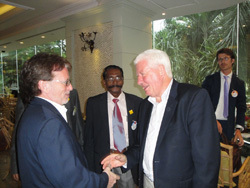 Approximately 115 participants from around the world attended the event. 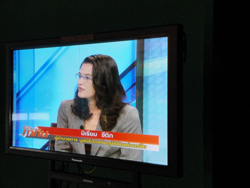 Mirjam Sidik, AIP Foundation's Executive Director, was invited to participate in a live interview on Thailand's PBS channel. The interview took place during the "Economic Hours Program" and analyzed the success of AIP Foundation's helmet wearing campaign. The interview aimed to glean best practices which could be applied to Thailand's current campaign. Dr. Rungthip Chotnapalai asked Sidik about the organization's past projects as well as its global-level response to the UN Decade of Action for Road Safety through the Global Helmet Vaccine Initiative. 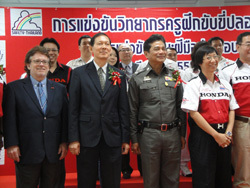 The 10th contest of driving coaches, organized by AP Honda Co., Ltd. took place at the Honda Safe Driving Center. The contest was organized to promote road safety and helmet use, in support of the government's campaign. AIP Foundation President Greig Craft attended the event, along with Mr. Worawat Auapinyakul, Minister of the Prime Minister's office, who attended the opening ceremony on behalf of the Prime Minister. Boda-Boda: Uganda's silent killer - The danger, health threats, and convenience of using Uganda's boda boda motorcycle taxis are identified and analyzed in a concise manner, painting a picture of the mode of transportation that is a major cause of road accidents. With the ultimate aim of educating children, teachers, and parents in Kampala about helmet use, the Ugandan Helmet Vaccine Initiative has begun a campaign in primary schools. Buganda Road Primary School, located in the heart of Kampala, is a public day school for 2,605 students aged 6 to 13. Information was delivered during the Annual General Assembly for Parents on March 24th. The second is Kitante Primary School, with 3,250 students. This school engaged students, parents, and teachers during the school's Sports Day on March 23rd. First, presentations explained to parents and teachers how and why helmets are important in preventing serious fatalities and injuries. Next, skits illustrated these messages through concrete examples. Finally, 100 helmets were donated to students who frequently rely on boda bodas (motorcycle taxis) for transportation. Last January, the Uganda Helmet Vaccine Initiative organized workshops to teach boda boda (motorcycle taxi) operators about helmet use. 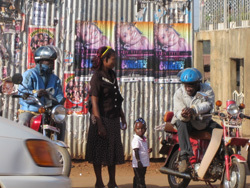 Two months later, observations were conducted with the US Centers for Disease Control and Prevention (CDC) to assess their helmet wearing rates at their stages around Kampala. Before the donation, 42% of motorcycle drivers wore helmets. Three days after the workshops and helmet donation, helmet use had increased to 61%. On March 12th, two months later, 74% of observed drivers wore helmets. In four months, observations will be conducted again, hopefully following in the footsteps of these positive preliminary results. Six radio spots are running in Kampala to remind boda boda operators to wear helmets when they are on the road. The messages are being broadcasted on four different radio stations, along with DJ mentions. The radio spots were designed based on the Uganda Helmet Vaccine Initiative's baseline study which exposed two of the biggest impediments to helmet wearing: cost and discomfort. The campaign to increase boda boda operator helmet use reminds listeners of a common Lugandan saying, "Obulamu Bugagga", or, "Your life is your wealth". The radio spots are running in the mornings, midday, and late afternoon and will be aired for three months. 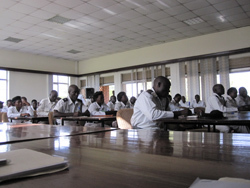 On March 11th, the final workshops for the Ugandan police forces of Kampala took place. This police training is part of the motorcycle helmet use campaign running from January 2011 to June 2012. Workshops for the police are a critical part of the campaign, as they focus on the importance of strict and correct enforcement of mandatory helmet laws. The workshop was attended by 100 police officers, and observed by two members of the US Centers for Disease Control and Prevention (CDC), Ann Dillinger and Rebecca Neumann.